Now that it’s officially spring, I thought what better way to celebrate than by wearing some white denim and gingham print! I know the whole, “Don’t wear white after Labor Day” saying is a little outdated, but I still feel silly wearing it before spring. Hah! I’m excited for warmer weather and longer days full of sunshine. Hooray for spring! On a side note, my little Beckham is such a sweetheart. He now gives kisses on command, and is walking around anywhere and everywhere he pleases. I can’t believe how fast he is growing up. Its not fair. I want him to stay little forever! Previous Post A Very Special Birthday / Giveaway!! Such a fresh look! I am excited to break my white jeans out soon too – I also like to wait until spring begins and it starts getting sunnier. Your son is adorable and so are his little booties! This is beyond adorable! So is your son! The outfit is perfect for spring and suits you incredibly! Awesome picks girl! I LOVE this outfit!!! Your son is adorableeee! Love both of your looks! You are gorg! I love this ensemble! Hooray for Spring, indeed 🙂 The gingham and pink paired with the white denim is just perfect! This is gorgeous! I love the colors! And I love how you layered this look! Perfect for spring!! just discovered your blog and I love it. I love your style and you are so pretty. Your new follower here ! Coming over from the Funday Monday link-up. This look is great! 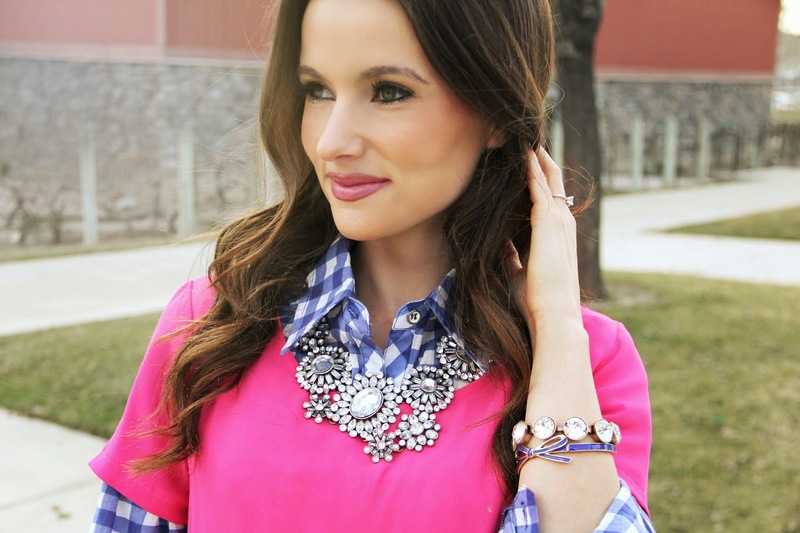 I love the pink and blue combo and that necklace is beautiful!! You should do a makeup tutorial because yours is stunning. 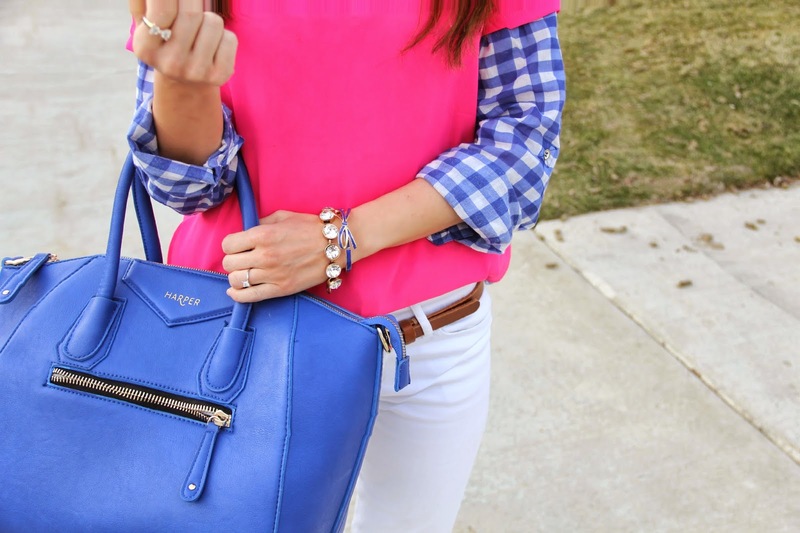 Love how whole outfit pops because of the beautiful colors you chose! Your bag is gorgeous! Love this whole outfit you look gorgeous.